Eyeglasses and contact lenses are no longer the norm for everyone who has vision problems. With the developments in modern medicine corrective eye surgery has made it possible to eliminate the use of vision aids in many cases. Not all vision problems qualify for corrective surgery but those that are can take advantage of laser surgery or iLASIK. LASIK or Laser-Assisted in Situ Keratomileusis, is a procedure which uses laser technology to correct vision problems. During the procedure a laser is used to reshape the cornea and improving vision. Topography guided corrective eye surgery is once such procedure but with a higher level of accuracy. In addition, bladeless LASIK, also known as iLASIK has made the surgery even more precise. What is topography guided corrective eye surgery? Topography guided laser surgery allows your surgeon to customize the procedure specifically to your needs by providing extra information about the structure of your eye. Using the technology each case can be personalized depending on the shape and structure of the patient’s eye. The effect is a more accurate correction resulting in better vision overall. How does topography guided corrective surgery work? LASIK works to correct visual problems that arise from an irregular shaped cornea. The procedure aims to correct the irregularity resulting in better vision. What topography guided LASIK does is fine tune the measuring of the cornea making the measurements more accurate and adding new dimensions. With the more detailed measurements, the correction procedure can be more precise and the results greatly improved. Even before the procedure, you will need to undergo an eye examination. During the examination, your eyes will be observed and measurements taken. A full evaluation of your eyes will be conducted. It is recommended that you don’t wear your contact lenses for at least three days before the examination; your doctor will inform you if the period needs to be longer. The iLASIK surgery is performed under topical eye drop anesthesia, with a small amount of oral sedative like Valium. 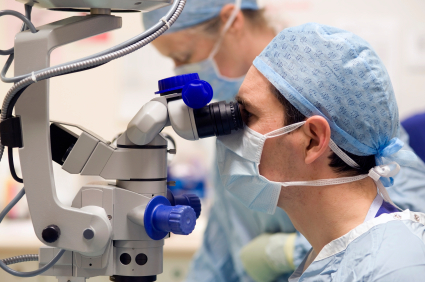 A surgical tool called a microkeratome is used to make a slit in the cornea which allows a layer to be peeled back. The surgeon can now work on the corneal tissue and reshape it as required using lasers. The flap is then replaced, smoothed into place, and the procedure is complete. The whole procedure takes about ten to 15 minutes per eye. Your doctor will prescribe eye drops that you will require after the surgery, these drops help prevent infections and inflammations. Recovery and healing after a topography guided corrective eye surgery is usually quick and without complication. Topography guided LASIK has been shown to have excellent results in improving conditions like farsightedness, nearsightedness, astigmatism and presbyopia.